It is almost Christmas day! 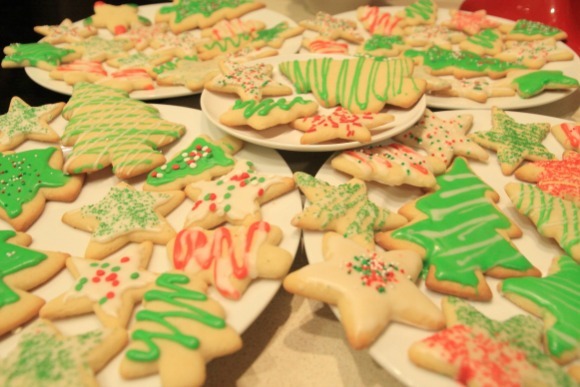 Our house is decorated, the presents are ready and we've been busy baking cookies and playing in the snow. Our daughter's preschool held their little Christmas performance last Thursday, which delighted everyone in the audience. It was so sweet to watch a lively group of 3 & 4 year olds reciting rhymes (complete with actions and big smiles) and singing their little hearts out to the tune of well known carols! I want to wish you all a very happy festive season and also take the opportunity to say THANK YOU for helping make 2013 such a great year for home♥stitch♥ness! It was a dream come true for me to finally begin selling my cross stitch patterns after so many years of creating and dreaming. I have learnt a lot about running a small business this year and have been very grateful for the support of so many people. There have been a couple of real highlights, too, such as having my 'joy' ornament design featured in the 2013 Christmas showcase edition of the NZ creative lifestyle magazine, The Jam Jar Magazine, as well as on the official DMC Threads Blog during their 'Twelve Weeks of Holiday Projects'. Above all, the feedback I've received from YOU - friends, family, fellow stitchers and customers - has been so encouraging! Thank you all for following along as I have started on this journey - your interest and support means so much to me! I am looking forward to releasing three new designs in January 2014 and hope to post a couple of sneak peeks for you over on the Facebook page soon :o) In the meantime, may you and your families have a very merry Christmas and best wishes to you all for the year ahead.